Oh, mint and chocolate. Two flavors, each so wonderful on its own, but elevated to the euphoric when combined. Admit it – unless you’re a robot, you probably like mint and chocolate. Vanilla may rule the ice cream roost for the general populace; but in my house, it’s mint chocolate chip ftw. My afternoon weakness is a certain and particularly excellent bar of dark chocolate with crunchy mint bits. And need I bring up Thin Mints? But it’s not a combination you often see in breads; and why not? Chocolate and bread go together, mint and bread go together; what could possibly go wrong? Nothing, is what. But, partly to play it safe, I elected to use these flavors in a quick bread. I’m sure a crusty, airy, long-rising yeast bread would have handled the task beautifully (and I do intend to try it someday). But the truth is this week, I was craving something soft and gooey, rather than crunchy and hearty; something with a really robust hit of chocolate, rather than sporadic bits here and there. The recipe calls for some optional peppermint extract. If you’re using a large bunch of mint (I probably had about 1/2 cup of leaves, packed), you may not need the extract. I added about 2 drops, just to try it, and the mint flavor was subtle, but present. If you like a very strong mint flavor, or if you don’t have many leaves, you may want to add the full 1/8 teaspoon. Just remember, though; a little peppermint extract goes a very long way! But as for the muffins themselves, overall: oh, my, yes. Chocolate! Mint! Chocolate-mint! They’re soft and moist, with a pleasant and appropriate crunch to the crust. You may find them a bit undersweet, but I like to taste the deepness and bitterness of the chocolate. Obviously, the darker the chocolate you use, the more bitter; you can certainly use another type, even milk chocolate, if you prefer. Even white chocolate would not be out of place. But if you, like me, are head-over-heels for the crisp freshness of mint paired with the darkest of dark chocolates, just give this one a try. With this in your repertoire, you need not wait for Girl Scout Cookie season for your chocolate-mint fix ever again! 1. Heat the milk and mint leaves in a small saucepan over medium heat, until the milk steams and bubbles just begin to form around the edges, stirring occasionally. Remove from heat, cover, and let steep until just barely warm, about 30 to 45 minutes. 2. Strain the milk into a measuring cup, pressing on the mint leaves to extract all moisture. Discard leaves. Add vinegar to milk, stir, and set aside. 3. Preheat the oven to 375° F, and position a rack in the center. Grease 16 cups of 2 standard muffin tins, or line them with paper muffin liners. 4. In a small microwave-safe bowl, combine the butter and half of the chopped chocolate. Microwave for 30 seconds, stir, and microwave again for 10 second increments until melted together and smooth, stirring after each interval. Add the olive oil, and stir until combined. 5. In a large bowl, whisk together the flour, sugar, cocoa, baking powder, baking soda, and salt. Add the egg and bourbon to the milk in the measuring cup, and stir with a fork until well combined. If the milk doesn’t smell very minty (or if you’d like a powerful mint flavor), add the peppermint extract. 6. Pour the liquid ingredients and the melted butter and chocolate over the dry ingredients. Using a spatula, gently and quickly stir until just blended together. Some lumps and streaks of flour may remain. Being careful not to overmix the batter, fold in the remaining chopped chocolate. 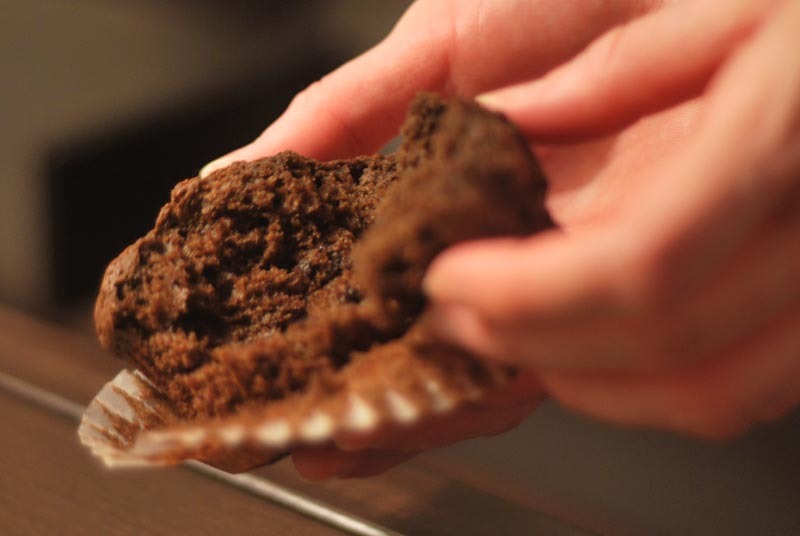 Divide the batter evenly among the muffin cups, until each is 3/4 full of batter. 7. 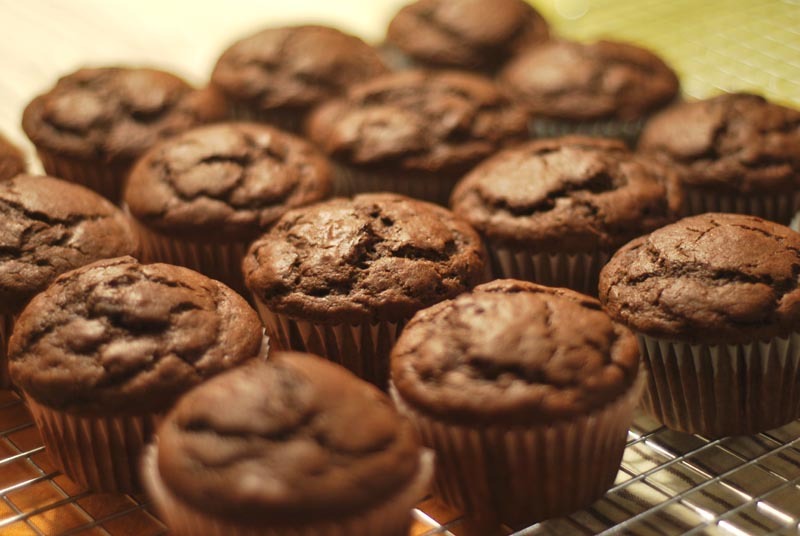 Bake at 375° F for 20 minutes, or until fully baked and the muffins feel slightly firm when pressed lightly. Transfer the pan to a rack and cool 5 minutes before removing muffins, and letting cool completely on the rack. 1. Do not use chocolate chips for the chocolate, as they will not melt properly. 2. Instead of the bourbon, you can substitute 2 teaspoons vanilla extract if you like.